Is it illegal for a Sheriff to enforce Federal Laws? One State, Connecticut, has answered the question on their website. Their answer was in general, not at all. SUMMARY: Connecticut law authorizes state and local police to arrest people for violations of federal criminal law. Their report was in regard to the very same issue, immigration laws, that has been a contention between the Obama Administration and Sheriff Arpaio of Arizona. Arpaio’s county, Maricopa, has over 4 million people, making it bigger in both population and square miles than many States in the USA. 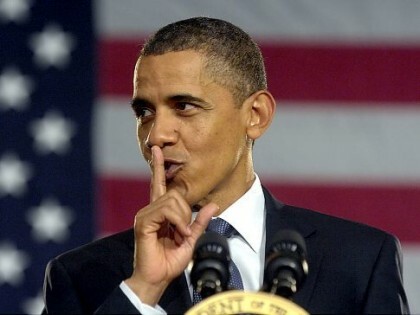 The contention between the parties is that Obama does not want Federal laws enforced by Arizona and in many cases he also does not want the same laws to be enforced by the Federal government either. This is where the strange tale of Judge Murray Snow and Sheriff Arpaio starts. It takes many amazing turns from there, including an attempt to put Arpaio into jail. As is common, the news media has left out many important factors in this case for apparent political reasons. Federal Judge Snow in Arizona ruled in 2013 that Sheriff Joe Arpaio had acted illegally by enforcing the immigration laws of the United States. In an October 2013 injunction, the Honorable G. Murray Snow ordered Arpaio’s Maricopa County Sheriff’s Office to stop enforcing the nation’s immigration laws. The Sheriff’s office could only enforce Arizona state crimes. The case is Melendres v. Arpaio in the U.S. District Court for the District of Arizona sitting in Phoenix. Arpaio’s crime? 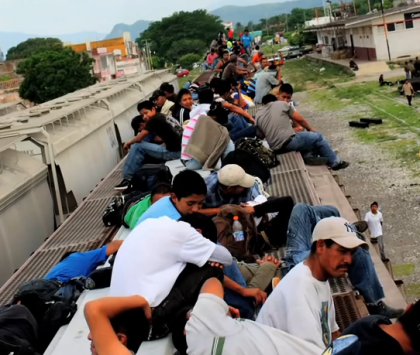 The evidentiary hearings held in February and April of 2015 revealed that the Sheriff’s office did not stop enforcing immigration laws fast enough. Arpaio admits that some of his Sheriff’s deputies continued to arrest and detain illegal aliens and turn them over to Homeland Security’s Immigration and Customs Enforcement (ICE) Service even after the Court’s injunction. Joe Arpaio and his Chief Deputy Gerald Sheridan attribute this to inadvertent mistakes in (a) misunderstanding the court’s order and (b) failing to update office’s training fast enough to inform Deputies exactly what was allowed and not allowed under Judge Snow’s 2013 order. But now, at the same time, several bombshell developments were exposed in the hearings. Judge Snow has now been unmasked as hating Sheriff Joe Arpaio. Judge Snow is determined to “do anything to get Arpaio out of office.” How did we find that out? So far, it appears that neither Judge Snow nor his wife have denied any of this. 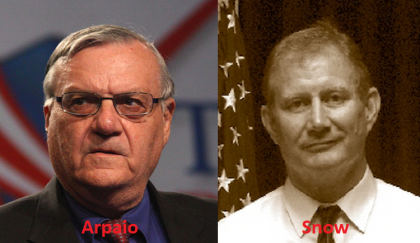 They don’t deny that Judge Snow hates Arpaio. They don’t deny that the Judge is trying to get Arpaio out of office. Despite the obvious appearance to the public that Judge Snow’s bias has corrupted the federal judiciary and the lawsuit against Arpaio, there has been no apology. So can a federal judge continue to preside over and decide a lawsuit after his wife reveals that the judge hates the defendant in the case and “will do anything” to ruin the defendant’s career? Does the law allow this? Not according to Law Professor Ronald Rotunda, a distinguished expert on legal and judicial ethics. Professor Rotunda’s analysis concludes that Judge Snow has an incurable conflict of interest because he is personally interested in these matters concerning his own wife. If it is true that Snow hates the Defendant in the lawsuit in front of him and will do anything to get Arpaio out of office, Snow is too biased to continue as the judge in the trial. But if it is not true and Judge Snow’s wife publicly said it is, then Judge Snow has a personal problem between himself and his wife. He cannot be objective. On April 23 and 24, Judge Snow diverted the April 21-24 evidentiary hearing about the original injunction to his own personal interests. 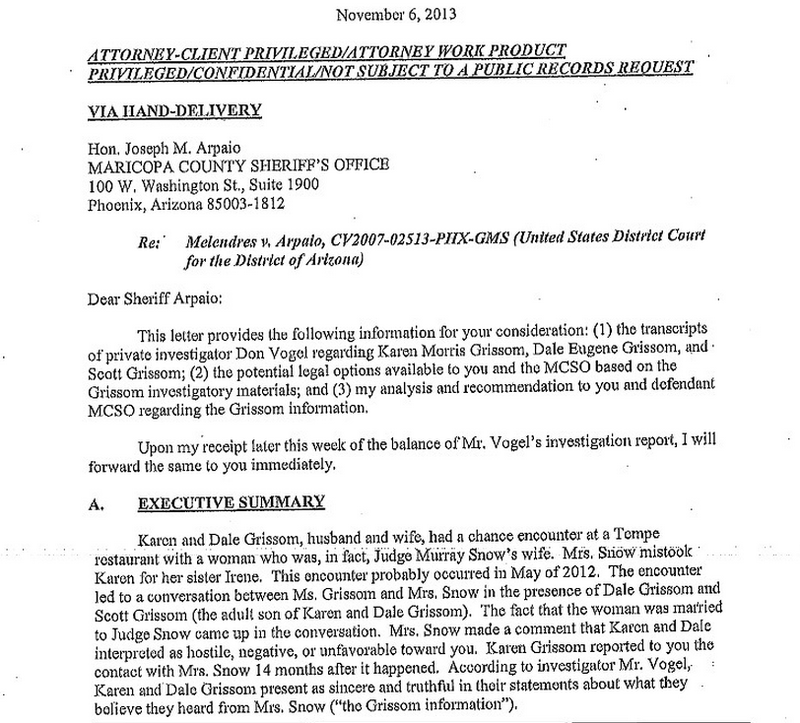 In 2013, Karen Grissom had informed Sheriff Arpaio about Judge Snow’s wife’s conversation. So of course Arpaio’s attorney, Tim Casey, dispatched a private investigator Don Vogel to interview the Grissoms and assess their credibility. The interviews confirmed the reports. Obviously, a judge cannot investigate his own personal interests or matters relating to his own family. However, then Judge Snow suddenly started conducting his own investigation on April 23 into whether Sheriff Arpaio investigated the judge’s wife or the judge himself. Instead of addressing concerns about the judge’s own bias, Judge Snow has treated Arpaio’s inquiries into Judge Snow’s illegal eligibility to remain on the case, as illegal in turn. Judge Snow personally took over the questioning. None of the parties have asked for this. It is all initiated by the Judge personally on his own. Judge Snow: I’m going to direct you to keep that e-mail. What did the e-mail say, to the best of your recollection? Sheriff Arpaio: I think it mentioned that Judge Snow wanted to do everything to make sure I’m not elected. Judge Snow: Do you recall who the author of that e-mail was? Sheriff Arpaio: I believe it was someone named Grissom. Judge Snow: Grissom? Sheriff Arpaio: Grissom. Judge Snow: Okay. And how did this person purport to know that? Sheriff Arpaio: The person met your wife in a restaurant, and she’s the one that made those comments. Judge Snow: According to whatever Mr. Grissom said. Sheriff Arpaio: There was other witnesses, yes. Judge Snow: Okay. And so you turned that over to your counsel and counsel hired a private investigator, and what did the investigator do? Sheriff Arpaio: He investigated it. Judge Snow: And what was the result of the investigation? Sheriff Arpaio: Results were that he confirmed that your wife was in that restaurant and con — I guess talked to the witnesses, three or four, that confirm that remark was made. Have you ever heard of a Judge conduct questioning a witness about what his own wife said about himself, as a sitting Judge on a case? The conflict of interest is spectacular. But consider the big picture: Joe Arpaio is running for re-election as Sheriff in 2016. 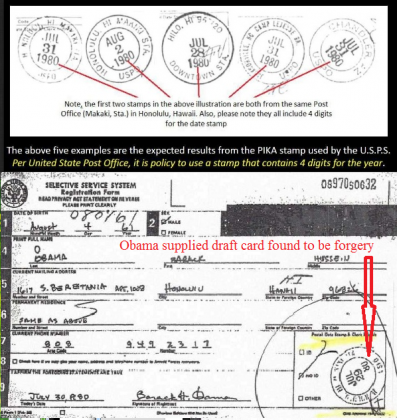 As Arpaio has investigated things about Obama that others fear to do, he is seen as a danger to Obama and the Democrat Party. Arpaio’s popularity at the polls drives Democrat elites bonkers. Therefore, it appears they are using the courts in a corrupt manner to defeat a popular conservative official they have not been able to defeat lawfully in elections for decades. Arpaio has been elected six times in a row now. Furthermore, Judge Snow demanded that Arpaio and his top leaders give their opinions in court whether Sheriff Arpaio had misspent County funds. That has absolutely nothing to do with anything in the lawsuit. But Judge Snow’s questions, under the authority of the court, provide ammunition in the 2016 election campaign to be used against Joe Arpaio by his opponents. There appears no relevance to Judge Snow’s questioning, other than to try to influence the upcoming election for Sheriff. In other words, Snow is doing exactly what his wife predicted – using the litigation to defeat Arpaio in the election campaign. Many Americans have rallied around Sheriff Joe after the Obama administration targeted him. Over the last two years, grassroots citizens have donated $5.5 million http://www.usatoday.com/story/news/politics/2015/05/04/joe-arpaio-campaign-money/26886723/ to Arpaio’s 2016 re-election campaign. But Arpaio’s campaign manager projects that he will need to raise $10 million to win. Billionaire Democrat kingpin George Soros specifically and publicly targeted Arpaio in the last election. Importantly as you now know from court transcripts, during the course of the contempt proceeding, it was reported that Judge Snow’s wife had said to her friends at a public restaurant that her husband was going to use the case to destroy Sheriff Arpaio to prevent him from being re-elected. A lawyer who has observed this case, Larry Klayman of Freedom Watch http://www.freedomwatchusa.org/, has said this to the press about Snow: Despite his conflict of interest and obvious prejudice against Sheriff Arpaio, just in the last week or so, during the course of the trial, Judge Snow called the sheriff to the witness stand and, asking leading questions, interrogated him and later his chief deputy, Jerry Sheridan, about investigating the judge over his wife’s prejudicial comments. Judge Snow was thus strategically using a judicial proceeding upon which he was presiding, for his own personal reasons, to cover up the admissions made by his wife, unethically creating a clear conflict of interest. As bad, during the course of the questioning, Snow used the opportunity to go off on an irrelevant witch-hunt regarding what the Sheriff and his deputies were allegedly doing with informant Dennis Montgomery, also my client. Montgomery is a whistleblower who has the goods on illegal surveillance by the NSA and CIA. Klayman famously recently won a case at the Supreme Court about illegal NSA government snooping into citizens phone calls. If not for the protection of the press it appears Judge Snow would have been forcibly removed from this case by now and possibly prosecuted for judicial corruption. If you believe this type of judicial corruption needs to be stopped, you can help by sending this article to your friends.